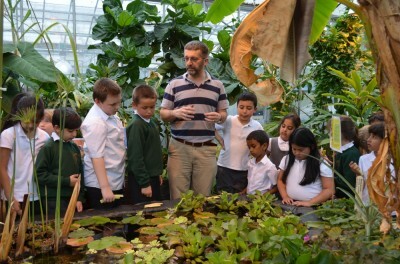 Standing amongst the dense foliage of large exotic plants with the smells of damp earth and fragrant leaves around me, the sun cooking the air, I tried to explain to a group of pupils from Highwood Primary School why plants are exciting, why we cannot live without them and how the basic parts of ‘roots, stems and leaves’ function and fit together to form living organisms. 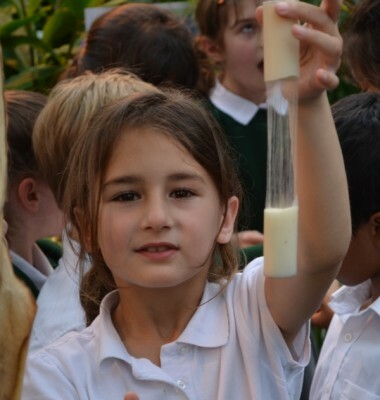 The visit started with an email: “We are learning about the functions of the different parts of plants (stem/roots /leaves) and the conditions plants needed to survive.” – can you help? The large leaf of a banana tears in the wind but does not break. While it you might think that a tropical glasshouse is not the ideal place to see ‘a variety of common flowering plants’ you would be very wrong. Tropical plants include rice, sugar (cane), sweet potato, pineapple, bananas, black pepper and a range of other things we meet every week in the supermarket. 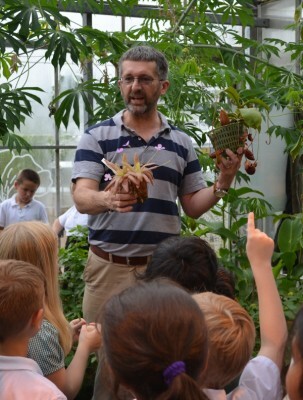 Access to such a wide variety of plants that form part of our everyday diet opens many opportunities to engage children with new information through exploration of familiar things (food) in an unfamiliar (exotic) surrounding (the tropical growing environment). 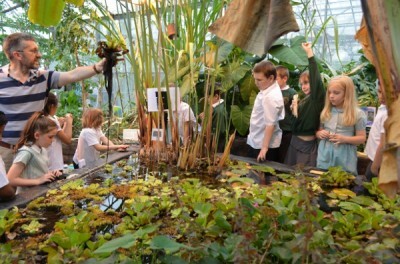 Highwood School look at the pond and it’s floating plants while adapting to the warmth of the glasshouse. Walking in from a warm early summer day on our green campus to the close heat in which these plants grow so well, the Highwood pupils realised that conditions comfortable to tropical plant growth are not necessarily comfortable for most people. Some had visited Asia or Africa and were excited to see plants from local markets, others were looking around to find a point of reference and picked up on the pineapple growing in its prickly rosette and the young green bananas towering above us all. The dense tropical displays give a very immersive feel to our glasshouse visits. Standing around the pond in the middle of the glasshouse one is surrounded by large exotic leaves, some from familiar plants and others from plants grown nowhere else in the UK. The underground stem of Turmeric gives curries their yellow colour – but take care, fresh Turmeric also stains your skin yellow! The most obvious stem-like stem was that of our sugar cane plant which forms a dense clump reaching from the ground to hit the roof 5 metres above our heads. Sugar cane is a solid grass stem, the central pith cells are very sugar rich, and very tasty in sunny weather. However not all stems are so obvious, sprouting from the ground at the base of the sugar cane is our Ginger plant. The stems of that are all underground with only leaves showing above. A quick grub around soon turned up some fresh ‘root’ ginger which is the underground storage stems of the plant. Turmeric shows the same growth form and has spectacular orange rhizomes. A more conventional stem is that of the banana which has tough fibres giving it great flexibility. The fibres in the banana stem give it great resilience and flexibility. 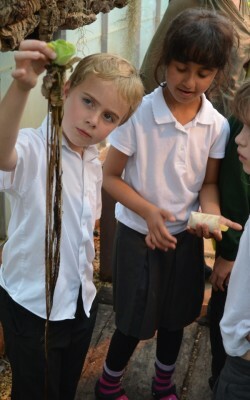 We then moved on to study leaves and shared the excitement of chopping down a bana plant that had finished fruiting so that we could all see that the stem like structure was actually made of leaves wrapped around each other. 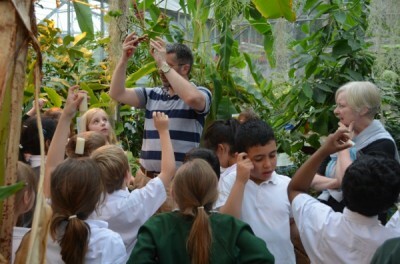 The largest leaves in the greenhouse (banana) measure over 4m long while some of the smallest include tiny orchids with leaves only 4mm long. Other leaves show great variety including the water resistant waxy leaves of cocoyam and the insect eating leaves of sundews, butterworts and pitcher plants. As well as different textures leaves show a range of different smells from the rather wet smelling taro leaf to the highly fragrant Grains of Paradise. Roots were illustrated with the sweet potato plants, some epiphytic orchids (that have fleshy green roots) and the very long underwater roots of the water lettuce and water hyacinth. 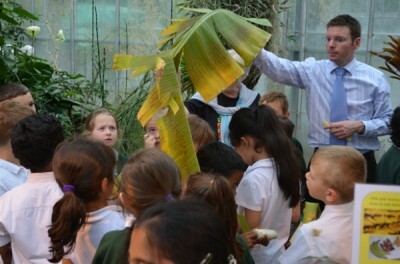 Many pupils took home small samples of sugar cane, banana stem, and Grains of Paradise leaves. There was a huge and intelligent range of questions asked and it was clear that the pupils had prepared well for their visit. This entry was posted in Interactive, Learning and Teaching, People, Primary Schools, Public, School Visits. Bookmark the permalink.